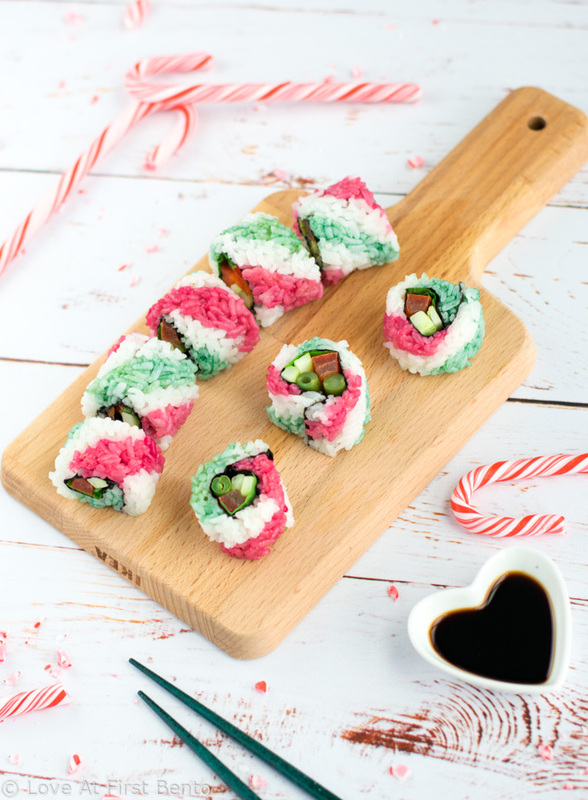 And good news: candy cane sushi is not as hard to make as it looks! What they do require is a little bit of extra time, and a lot of patience (which I found was made easier by listening/singing to Mariah Carey Christmas songs while I worked). 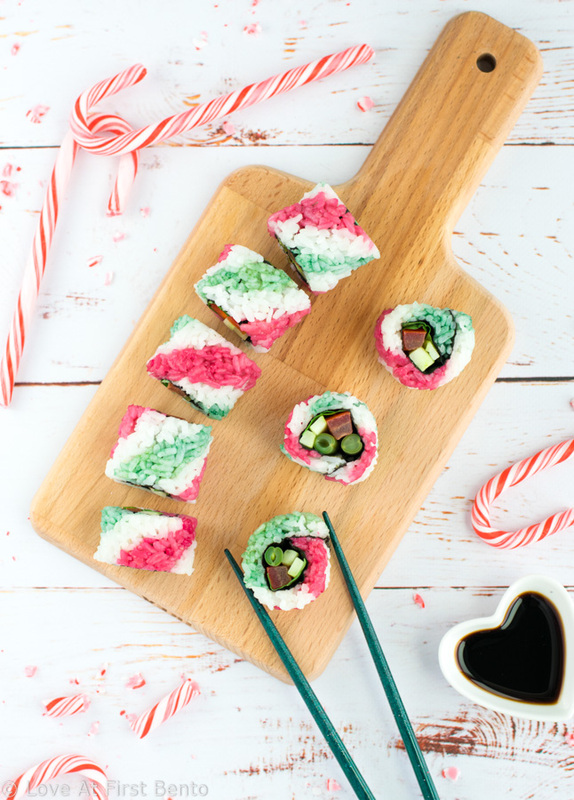 But I mean, if you have the fortitude to decorate vast quantities of Christmas cookies, then rest assured you already have the patience required to pull off your very own candy cane sushi rolls. The end result, at any rate, will most definitely make your valiant efforts worth it; these sushi rolls are undeniably gorgeous, and will leave you brimming with pride as soon as you see the finished product. To make the iconic candy cane stripes, I used beet powder to naturally dye the rice red, and spirulina powder to dye the rice a deep green. 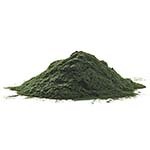 Spirulina is an algae powder, and I find the green variety provides the perfect evergreen color for when I want to dye my rice Christmas colors. 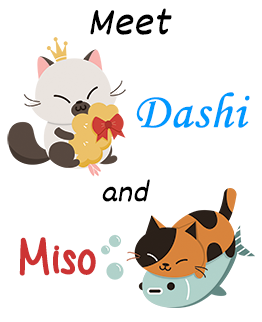 However, feel free to use matcha powder (as I did to dye Dinosaur Pusheen) if you’re okay with a lighter shade of green, or spinach powder for a darker green. 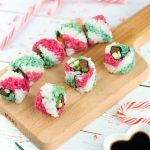 Alternatively, you could also skip the green rice altogether, and simply make a red and white striped candy cane sushi roll instead. Wrap your sushi mat fully in plastic wrap. Rather than placing a sheet of unsecured plastic wrap on top of the sushi mat, take the time to fold it over all four sides of the mat, so that it stays in place once you go to roll the rice up. You can even tape the plastic wrap in place if it’s being uncooperative! Give the mat a quick roll to expel excess air from the plastic wrap before you begin. Make sure you are always working with wet hands. I always keep a bowl of water next to me when assembling my sushi, which I use to dip my fingers into in between each stripe of colored rice. 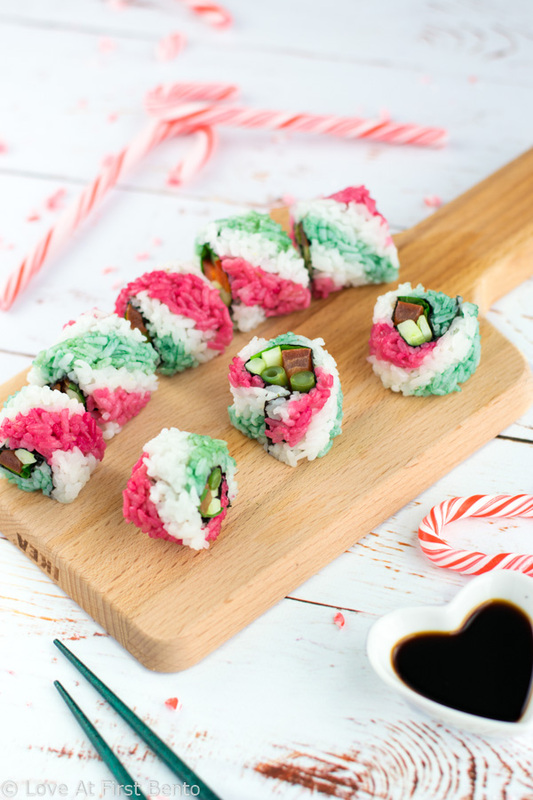 Trust me, you do not want to try working with sushi rice when your hands are dry, and especially not when you’re trying to create a diagonal candy cane stripe pattern. Larger stripes = less work. Thinner stripes = better end result. Making your candy cane rice stripes larger and fatter means you’ll have less stripes to shape, but the end result won’t be quite as spectacular than if you were to take the time to create a series of thin candy cane stripes. 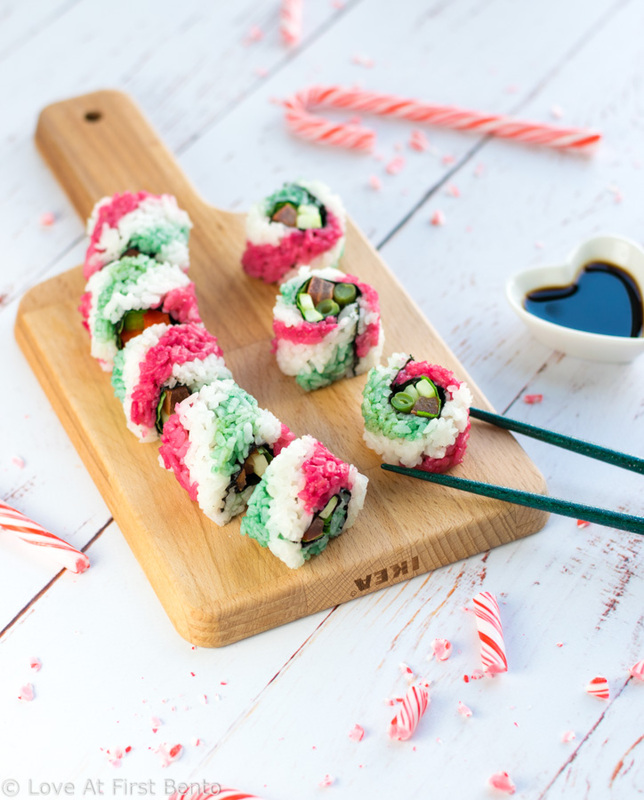 Decide in advance how much time and patience you’re willing to devote to your candy cane sushi creation. Ultimately, though, it’ll still look good no matter which size of stripes you end up making! While you can fill your candy cane sushi with any filling you’d like, I decided to keep my rolls 100% vegan by filling them with “Christmas colored” vegetables, which included strips of cucumber, tomato, green beans, and red and green bell peppers. 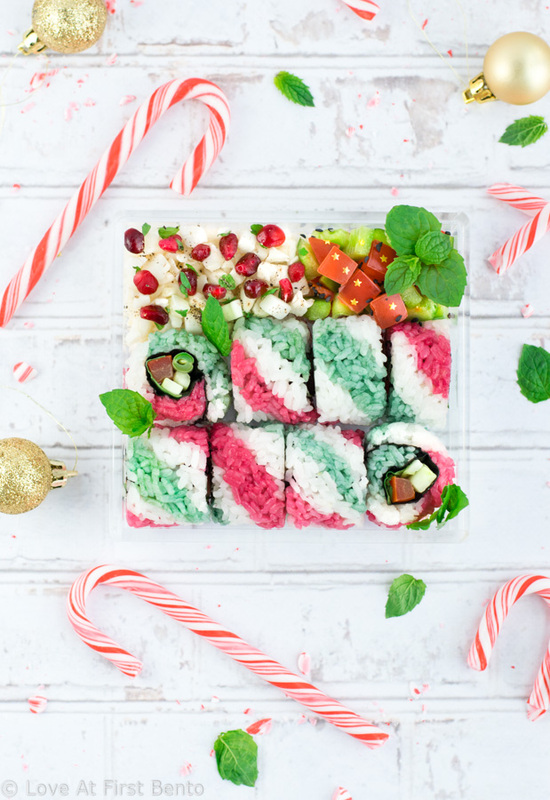 For an extra touch of fun, and to make the candy cane sushi ever so slightly reminiscent of an actual candy cane, I decided to add some fresh mint leaves as well; mint pairs beautifully with the cucumber, tomato, and green beans, so be adventurous and give it a try for the full candy cane experience! To really show off the beauty of the candy cane stripes, I packed the candy cane sushi rolls in my clear bento box, and presented most of them with their outsides facing up to ensure the stripes were the main focus. Accompanying the sushi were sides of a jeweled cauliflower salad (consisting of raw cauliflower bits, pomegranate arils, and torn fresh mint), and “Christmas” peppers, which are just diced green and red bell peppers sauteed in a little bit of sesame oil, sesame seeds, and, because I couldn’t help myself, topped with a few edible gold stars. My goal was to create an elegant vegan bento box that celebrated the beauty of Christmas colors. Divide warm, cooked sushi rice into 3 equal portions, roughly 1/2 cup each. Set one portion aside (this will be for the white candy cane stripes). Green Rice: In a small bowl, combine 1 – 2 tablespoons of warm water with spirulina powder and mix until dissolved. Add your homemade dye to one portion of rice and mix until evenly colored. Feel free to add more spirulina until desired green color is achieved. 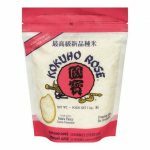 Red Rice: In a small bowl, combine 1 – 2 tablespoons of warm water with beet powder and mix until dissolved. Add your homemade dye to one portion of rice and mix until evenly colored. 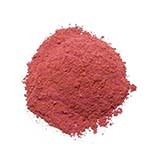 Feel free to add more beet powder until desired red color is achieved. 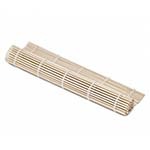 Fully wrap your bamboo sushi mat in plastic wrap, then lay it flat so that the slats are horizontal. Place half a sheet of nori (shiny side facing DOWN) on top of the sushi mat. With clean, wet hands, begin to create a diagonal stripe pattern across the nori with the red, green, and white rice – you can follow the pattern provided in the image below, with stripes alternating between green-white-red-white. 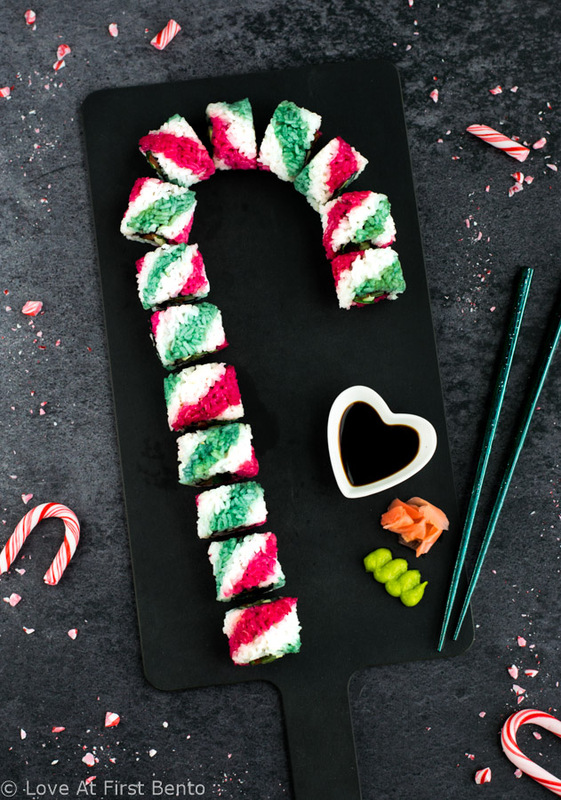 Simply use your hands to spread the rice into diagonal stripes, adding stripes until the entire sheet of nori is covered and you’re left with a candy cane pattern. Do your best to keep the stripes roughly the same size. With wet hands, carefully pick up the nori and flip it over so that the rice side is facing down. Aim to place the nori near the bottom edge of the bamboo mat. Place your fillings near the bottom-middle end of the nori, making sure to keep them tight together and horizontally aligned. oooh love that you used beet and spirulina powder to color these! i’ve only seen spirulina used for smoothies, so it’s cool to see it used elsewhere. 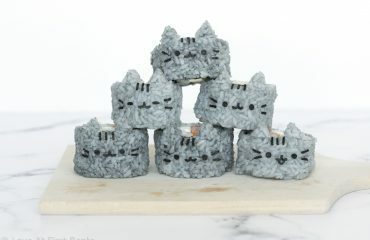 Hands down you just won the CUTEST HOLIDAY DINNER EVER! I’ve made sushi a hand full of times and it turned out great, except, I’m not very good at rolling. My rolls looked really wonky. 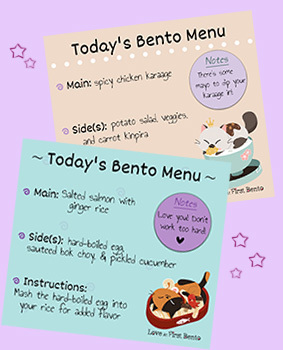 I think I would have a hilarious “nailed it” version of the Candy Cane Sushi Bento on my hands if I attempted this recipe. But seriously though, amazing job. 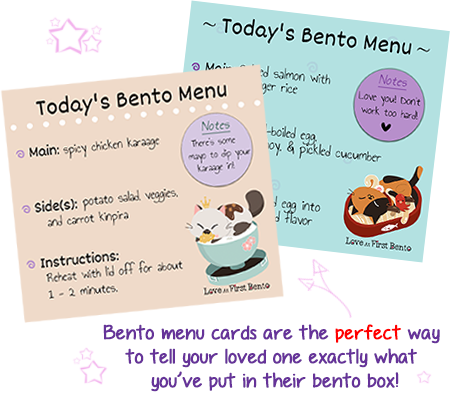 Your recipe turned out so freaking adorable! Oh wow, thank you SO much for the lovely comment Christina – made me so happy! 😀 😀 If it makes you feel any better, rolling up the sushi is the hardest part for me too. It gets a bit easier the more used you are to working with rice though, I find (working with it as in shaping it into onigiri and cute shapes, haha, which I’m always doing 😆 ). Thanks again for stopping by, so glad you enjoyed this recipe! Oh my goodness this is GENIUS! So, so cute and so festive and gorgeous. Ahhh. Merry merry Christmas Shannon! Oh wow, thank you so much for the kind words Cynthia, that means a lot! <3 So good to hear from you 😀 Merry Christmas to you and your family as well, I hope it's filled with lots of yummy food (and cookies, lol)! 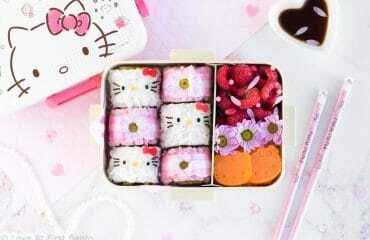 Hi Shannon, I love this bento! I would never have thought to use spirulina as a green dye. Such a good idea. Nice tip about using wet hands to shape the rice. 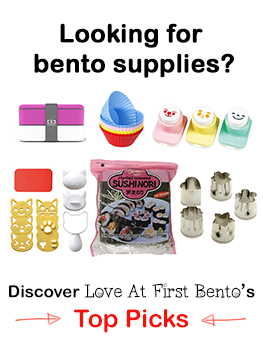 The first time I tried to make kimbap (with dry hands) I ended up picking sticky rice out of my hair for a week! Merry Christmas Shannon. I hope you have a lovely time with your friends and family. 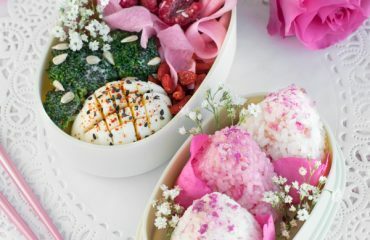 This is just SO festive and sweet!! I love it! 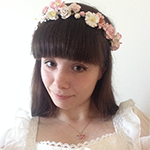 I love all of your creations – new follower here! I’ll be back!